American communications satellite. Domestic communication. Launching states: Japan, France, USA. At the time, these were the largest commercial spacecraft ever built. Status: Operational 1989. First Launch: 1989-03-06. Last Launch: 1991-10-29. Number: 7 . Gross mass: 4,330 kg (9,540 lb). Height: 11.80 m (38.70 ft). The series were also the first commercial satellites to employ Satellite Switched/Time Division Multiple Access (SS/TDMA) techniques. Spin stabilized with despun antenna. Hydrazine propulsion system. Passive thermal control. Telescoping dual-cylinder structure with deployed antennas. Body mounted solar cells generate 2250 W (EOL). Solar drums are each about 6m tall. 38 (plus 12 backup) C-Band and 10 (plus 4 backup) Ku-Band transponders.120,000 telephone calls and 3 color TV broadcasts simultaneously. JCSat 1, 2 Communication satellite built by Hughes for JSAT Corporation, Japan. Launched 1989 - 1990. Used the HS-393 bus. SBS 6 Communication satellite built by Hughes for Satellite Business Systems (SBS) =>, USA. Launched 1990. Used an HS-393 bus. Family: Communications, Geosynchronous orbit. Country: USA. Engines: R-4D. Launch Vehicles: Titan, Ariane, Ariane 44LP, Ariane 44L, Commercial Titan 3. Projects: Intelsat, JCSAT. Launch Sites: Cape Canaveral, Cape Canaveral LC40, Kourou, Kourou ELA2. Agency: Hughes. Bibliography: 2, 279, 6, 12563, 12564. JCSAT 1 - . Mass: 2,280 kg (5,020 lb). Nation: Japan. Agency: JCSAT. Program: JCSAT. Class: Communications. Type: Civilian communications satellite. Spacecraft: HS 393. Completed Operations Date: 1998-08-17 . USAF Sat Cat: 19874 . COSPAR: 1989-020A. Apogee: 36,018 km (22,380 mi). Perigee: 35,971 km (22,351 mi). Inclination: 4.10 deg. Period: 1,446.80 min. Japanese domestic communications; 150 deg E. Domestic communication. Launching states: Japan, France, USA. Launch vehicle Ariane 29 (Ariane IV). Launching organization ARIANE SPACE. Launch time 1129 GMT. Positioned in geosynchronous orbit at 150 deg E in 1989-1997; 148 deg E in 1997; 111 deg E in 1998 As of 31 August 2001 located at 19.12 deg E drifting at 2.653 deg W per day. As of 2007 Mar 11 located at 63.05E drifting at 2.678W degrees per day. 1989 October 27 - . 23:05 GMT - . Launch Site: Kourou. Launch Complex: Kourou ELA2. LV Family: Ariane. Launch Vehicle: Ariane 44L. Intelsat 6A F-2 - . Payload: Intelsat 602. Mass: 4,215 kg (9,292 lb). Nation: International. Agency: Intelsat. Program: Intelsat. Class: Communications. Type: Civilian communications satellite. Spacecraft: HS 393. USAF Sat Cat: 20315 . COSPAR: 1989-087A. Apogee: 35,795 km (22,241 mi). Perigee: 35,777 km (22,230 mi). Inclination: 0.70 deg. Period: 1,436.10 min. Stationed at 24.5 deg E. At the time, the Intelsat 6 series were the largest commercial spacecraft ever built. 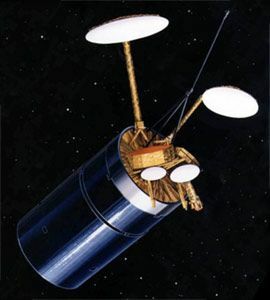 The series were also the first commercial satellites to employ Satellite Switched/Time Division Multiple Access (SS/TDMA) techniques. Spacecraft: Based on Hughes 393 bus. Spin stabilised with despun antenna. Hydrazine propulsion system. Passive thermal control. Telescoping dual-cylinder structure with deployed antennas. Body mounted solar cells generate 2250 W (EOL). Solar drums are each about 6m tall. Payload: 38 (plus 12 backup) C-Band and 10 (plus 4 backup) Ku-Band transponders.120,000 telephone calls and 3 colour TV broadcasts simultaneously. SS/TDMA (Satellite-Switched Time Division Multiple Access) techniques used. Positioned in geosynchronous orbit at 37 deg W in 1989-1990; 24 deg W in 1990-1991; 55 deg E in 1991; 60 deg E in 1992; 63 deg E in 1992-1997; 62 deg E in 1997-1999 As of 29 August 2001 located at 62.02 deg E drifting at 0.018 deg W per day. As of 2007 Mar 9 located at 150.55E drifting at 0.004W degrees per day. 1990 January 1 - . 00:07 GMT - . Launch Site: Cape Canaveral. Launch Complex: Cape Canaveral LC40. LV Family: Titan. Launch Vehicle: Commercial Titan 3. JCSAT 2 - . Payload: JCSat 2 / Orbus-7S. Mass: 2,280 kg (5,020 lb). Nation: Japan. Agency: JCSAT. Program: JCSAT. Class: Communications. Type: Civilian communications satellite. Spacecraft: HS 393. USAF Sat Cat: 20402 . COSPAR: 1990-001B. Apogee: 35,877 km (22,292 mi). Perigee: 35,868 km (22,287 mi). Inclination: 0.10 deg. Period: 1,440.50 min. Japanese domestic communications; 154 deg E. Domestic communications. Launching organization Martin Marietta. Launch time 0007 GMT. Positioned in geosynchronous orbit at 154 deg E in 1990-1999 As of 5 September 2001 located at 154.04 deg E drifting at 0.006 deg W per day. As of 2007 Mar 10 located at 116.78W drifting at 6.255W degrees per day. 1990 March 14 - . 11:52 GMT - . Launch Site: Cape Canaveral. Launch Complex: Cape Canaveral LC40. LV Family: Titan. Launch Vehicle: Commercial Titan 3. FAILURE: Second stage failed to separate due to a wiring error in the stage separation electronics, stranding the payload in low earth orbit.. Failed Stage: 2. Intelsat 6 F-3 - . Payload: Intelsat 603 / Orbus-21S. Mass: 4,215 kg (9,292 lb). Nation: International. Agency: INTELSAT. Program: Intelsat. Class: Communications. Type: Civilian communications satellite. Spacecraft: HS 393. USAF Sat Cat: 20523 . COSPAR: 1990-021A. Apogee: 35,790 km (22,230 mi). Perigee: 35,786 km (22,236 mi). Inclination: 0.00 deg. Period: 1,436.20 min. 38 C-band and 10 Ku-band transponders. Placed in unusable low earth orbit after second stage separation failure. In May 1992 shuttle STS-49 snared the satellite, and in three EVA's the crew attached a new perigee boost motor, which then reboosted the satellite to geosynchrounous orbit. Positioned at 34 deg W in 1992-1997; 24 deg W in 1997-2001. Later assigned to Intelsat spin-off New Skies, which positioned it at 340� East, from where it provided C-band coverage of the entire Atlantic region, including virtually all of Latin America, Europe, Africa, the Middle East, and the eastern half of North America. As an inclined orbit satellite, IS-603 was best suited for voice/data trunking and video contribution, but could also be used for carrier-scale IP services, notably network bridging and expansion. It supplemented the prime Atlantic region coverage provided by the station-kept NSS 7 satellite, located at 338� East. As of 2007 Mar 11 located at 19.96W drifting at 0.012W degrees per day. 1990 June 23 - . 11:19 GMT - . Launch Site: Cape Canaveral. Launch Complex: Cape Canaveral LC40. LV Family: Titan. Launch Vehicle: Commercial Titan 3. Intelsat 6 F-4 - . Payload: Intelsat 604 / Orbus-21S. Mass: 4,215 kg (9,292 lb). Nation: International. Agency: INTELSAT. Program: Intelsat. Class: Communications. Type: Civilian communications satellite. Spacecraft: HS 393. USAF Sat Cat: 20667 . COSPAR: 1990-056A. Apogee: 35,792 km (22,240 mi). Perigee: 35,780 km (22,230 mi). Inclination: 0.00 deg. Period: 1,436.10 min. International communications; 63 deg E. Positioned in geosynchronous orbit at 38 deg W in 1990; 27 deg W in 1990-1992; 60 deg E in 1992-1999 As of 3 September 2001 located at 60.04 deg E drifting at 0.000 deg E per day. As of 2007 Mar 11 located at 61.81E drifting at 6.628W degrees per day. 1991 August 14 - . 23:15 GMT - . Launch Site: Kourou. Launch Complex: Kourou ELA2. LV Family: Ariane. Launch Vehicle: Ariane 44L. Intelsat 6 F-5 - . Payload: Intelsat 605. Mass: 4,296 kg (9,471 lb). Nation: International. Agency: Intelsat. Program: Intelsat. Class: Communications. Type: Civilian communications satellite. Spacecraft: HS 393. USAF Sat Cat: 21653 . COSPAR: 1991-055A. Apogee: 35,788 km (22,237 mi). Perigee: 35,784 km (22,235 mi). Inclination: 0.00 deg. Period: 1,436.10 min. International communications; 14.5 deg W. Positioned in geosynchronous orbit at 24 deg W in 1991-1997; 27 deg W in 1997-1999 As of 2 September 2001 located at 27.48 deg W drifting at 0.015 deg W per day. As of 2007 Mar 10 located at 174.03E drifting at 0.000W degrees per day. 1991 October 29 - . 23:08 GMT - . Launch Site: Kourou. Launch Complex: Kourou ELA2. LV Family: Ariane. Launch Vehicle: Ariane 44L. Intelsat 6A F-1 - . Payload: Intelsat 601. Mass: 4,330 kg (9,540 lb). Nation: International. Agency: Intelsat. Program: Intelsat. Class: Communications. Type: Civilian communications satellite. Spacecraft: HS 393. USAF Sat Cat: 21765 . 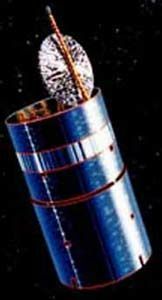 COSPAR: 1991-075A. Apogee: 35,791 km (22,239 mi). Perigee: 35,784 km (22,235 mi). Inclination: 0.00 deg. Period: 1,436.20 min. International communications; 27.5 deg W. Positioned in geosynchronous orbit at 27 deg W in 1992-1997; 34 deg W in 1997-1999 As of 2 September 2001 located at 34.48 deg W drifting at 0.002 deg W per day. As of 2007 Mar 10 located at 63.65E drifting at 0.000W degrees per day.